This is a favorite in our house and so easy to make. Trying to come up with easy meals can be a challenge. With a little of ingenuity and some old favourite recipes you can create a delicious meal.This recipe came about one day out of frustration. We always have chicken and it is served the usual way. Whatever that may be for you, ours is baked, fried and even steamed, with a side of veggies, and maybe rice, potato or pasta. One night I was going to bake my chicken breasts and then I thought why not serve them in a pita? For a salad I thought why not just add the lettuce into the bun along with the chicken. Hey now the meal was coming together. When I finished I had just created a chicken sandwich, of sorts. So simple yet so different. Here are your ingredients. A baked chicken cut into pieces and deboned. I was in a hurry this time so I purchased one already baked. Pita bread, sliced tomatoes, lettuce, sliced avocado, sliced onions and pickles for us. Oh and of course some hot peppers for me. Then you’ll also need some sour cream or yogurt. You can add what you like. Next warm the pita and build your sandwiches. As you can see some don’t like many ingredients. Some like a lot. It is totally up to you. 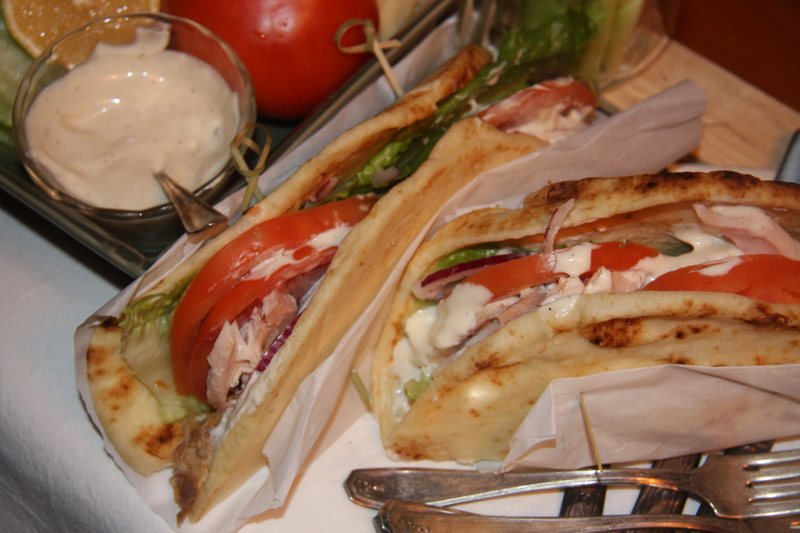 Warm the pita and assemble the sandwiches with your favourite ingredients.